We believe the internet has become humanity’s most important technology. We build crypto-market protocols, systems, and tools to improve how it works. Today, we are focused on how we store, locate, and move crypto-market information. We listen. We are passionate. We love to the fullest. We welcome change. We value our team. We love to win. We are fans. We are supportive. We are kind. We are positive. We collaborate well with others. We say Thank You. OTC Exchange, Inc. is developing several cryptocurrency projects that focus on the advancement of small global companies and cryptocurrency businesses. We are poised to meet the needs of companies, participants and investors at every level. OTC Exchange, Inc is the “NEW” fresh global face of small companies and crypto businesses. If you are reading this, chances are you are using the fruits of open work done every decade since the 1970s. We have all benefited enormously from Open Source. It’s everywhere: from the software we use daily, our OS kernels, our network stacks, and our web browsers; to open work processes like the IETF and W3C working groups; to the libraries we use and the contributions we get. The internet is what it is today thanks in great part to an Open work culture. We are the same: our code and our work is Open Source. Monitor 2,500+ cryptocurrencies. Get advanced alerts based on Buy, Sell, Volume and more. (Lite Version) - This version was originally developed with network resources, web speed, UI simplicity and functionality in mind. Coindex V1 is an interactive platform where you can analyze the latest Crypto trends and monitor all markets streaming in real time. View the latest Cryptocurrency price with our interactive and live price chart including market capitalization. 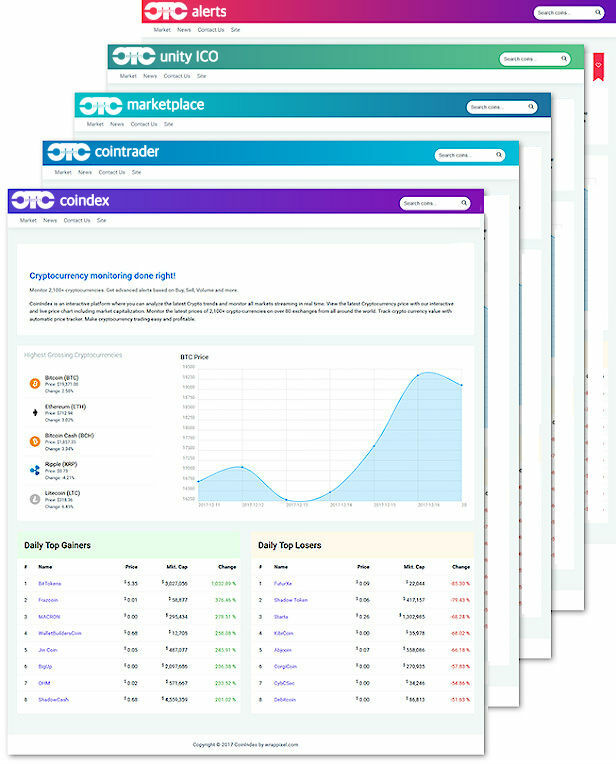 Monitor the latest prices of 2,500+ crypto-currencies on over 80 exchanges from all around the world. Track crypto currency value with automatic price tracker. Make cryptocurrency trading easy and profitable. • More than 2,300 cryptocurrencies are supported, including but not limited to Bitcoin, Ether, Litecoin, Monero, Ripple, Dogecoin, Dash, Zcash, Waves. • Cryptocurrency quotes are updated in real-time as new market data is available. • Cryptocurrency prices can be displayed in almost any fiat currency, including USD, EUR, GBP, CNY, JPY, AUD, CAD, SEK, RUB and others. • Dedicated page for each altcoin with interactive historical chart and data table. • A variety of color themes and templates are available to choose from. • Image logos are provided for each cryptocurrency. • All modern browsers and devices are supported. - Cryptocurrency quotes are updated in real-time as new market data is available. - Cryptocurrency prices can be displayed in almost any fiat currency, including USD, EUR, GBP, CNY, JPY, AUD, CAD, SEK, RUB and others. - Dedicated page for each altcoin with interactive historical chart and data table. - A variety of color themes and templates are available to choose from. - Image logos are provided for each cryptocurrency. - All modern browsers and devices are supported. It is the vision of the OTC Exchange to organize and provide a transparency layer for participants listed on various Cryptocurrency Markets. It is also the objective of OTC Exchange to provide clarity and transparency in the investment process for the common investor wanting to participate in the Cryptocurrency Market place.